Considering a Weber Spirit BBQ well make sure you take a good look at Napoleon range of gas bbqs as well, some Napoleon Gas Bbqs have a limited LIFETIME warranty! Such as the Napoleon Prestige BBQs and Napoleon Prestige Pro BBQs. With the SIZZLE ZONE infrared burners from Napoleon®, you get these benefits plus convenient gas technology: each burner contains thousands of gas outlets that heat the ceramic surface until it starts to glow red. The resulting infrared rays don't just warm the ambient air; the heat penetrates directly and deeply into the food. It also creates a consistent thermal area that, compared with a charcoal fire, is much easier to control. Weber radically redesigned their popular entry level gas barbecue range to emerge as a dynamic and really versatile entry level gas barbecue. These 2 and 3 burner Weber Spirit gas bbqs range in price from £479 to £1099 RRP, although BBQs 2u do offer huge discounts off the RRP! We always aim the have the best price available. The biggest change for the Weber Spirit range is the orientation of the burners. 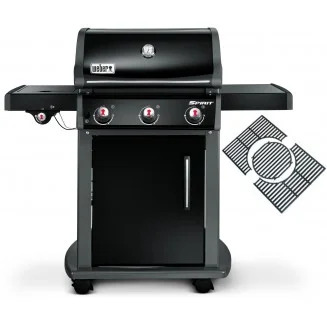 The previous range had the side table mounted control knobs and parallel burners, now all the Spirit bbqs have their stainless steel burners running from front of the bbq to back to improve grilling. Not to mention the design and style has been dramatically improved since 2013. During the week when time is short and everyone is busy, the gas barbecue is your best friend. Fast ignition, easy handling and perfect results. What's not to like? Meet the Weber Spirit - the perfect stepping stone into gas barbecuing. Ah-nothing compares to barbecuing! That special feeling you get when the heat is spreading, smoke starts seeping from the barbecue, and a tasty meal unfolds on the cooking grate right before your eyes is unparalleled. Many wish they could have this special feeling every day-even on a hectic day. This is probably why gas barbecues are so popular all over Europe. In just one click of a button the grill is lit, and just a few minutes later the grate is hot enough for your dishes. No matches, no hassle, no mess. In addition to this, the gas barbecue puts you in control of the grill temperature. With the turn of a knob, you can sear your meat at a high temperature, and you can even do ”low and slow", at a low temperature. Perfect for experiments on weekends when there is more time. The Weber Spirit series is the obvious choice if you want to get started with gas barbecuing. Created to make it simple for gas beginners to get on with the gas adventure, its features are extremely user-friendly, With the basic features you can do both direct and indirect grilling and begin to get the feeling of how to grill the gas way. The Spirit series offers three lines of models - the Spirit Classic, Original and Premium with either two or three burner tubes and a variable number of features. All Weber Spirit-models can be further upgraded with accessories-such as a rotisserie, griddles and Weber's Gourmet BBQ System. We are often asked what are the difference between these models, so we have decided to write up a Weber Spirit Comparison Guide for you. The entry level of the Spirit series with either two or three burners. The two-burner model, E-210 is perfect when you have less space as the side tables are foldable. The E-220 and E-320 models have a handy side burner. The mid level models have two or three burners but with more features. For instance the cart has a door on the front, they have cast iron grates and an electronic ignition system that secures quick ignition. The biggest model comes with side burner and GBS grates. The top of the series is the Premium models - brainboxes within the class. All equipped with extra luxury, including a stylish gas bottle screen, a condiment holder and a fully enclosed cart that keeps dirt out of the storage area. The control panel and side tables are stainless steel. The top models, E+S 330, are upgraded with a Sear Station. Buying a Weber Spirit barbecue is an investment, as Weber provide a limited guarantee of up to 10 years you can be assured that in the unlikely event that something goes wrong you have the backup of Weber's fantastic customer service. This is a very popular base model of the Spirit range, as more and more people are now limited on space in their gardens or patios Weber have cleverly addressed this by introducing a small 2 burner bbq with fold down side tables. Which means it takes up less space but still provides the owner with a full sized bbq experiance, easily cooking for up to 8 people on the 2323cm2 cooking area. 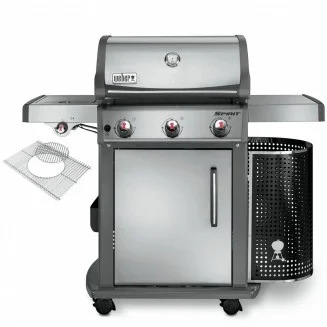 The Weber Spirit Classic E-310 shares many of the features used on the E-210, however the E310 has an additional stainless steel burner and a large cooking area. This extra burner makes it easier to cook on your barbecue using the indirect method, which is ideal for roasting large joints of meat and poultry. Fantastic for beer can chicken and cooking the sunday roast on your Weber BBQ! The larger cooking area is 2735cm2 which is 412cm2 larger than the E-210, this enables you to cook for up to around 12 people. The main difference between the E-320 and the E-310 is that the Weber Spirit Original E-320 has a side burner, neatly enclosed within the left side table! The side burner is ideal for cooking vegetables, preparing a pepper sauce for your barbecued steak. The Original E-320 also has 3 stainless steel burners but these are ignited using an electronic crossover ignition button rather than a mechanical click as used on the E210 and E310. The Spirit E320 also has the benefit of Porcelain-enamelled cast iron gourmet system cooking grates, which retain the heat evenly and produce perfect results every time - including the ever desirable sear marks on your food! 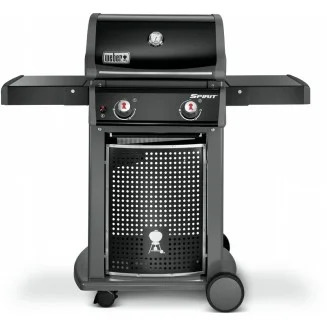 For 2015 the Spirit Original E-320 comes complete with Gourmet BBQ System grate as standard. Opening up a world of cooking opportunities, the GBS cooking grate includes a removable centre section which can be easily interchanged with any one of the Weber Gourmet BBQ System Accessories - each available separately. Externally it shares the same design and overall size of the E-310 but has an enclosed cart with a painted door compared to a mesh screen. This is the top of the Spirit range barbecue boasting the same features and design as the Weber Original E-320 barbecue but with a higher quality stainless steel finish. Along with stainless steel gourmet system cooking grate and stainless steel flavourizer bars. For 2015 the Weber Spirit Premium S-320 BBQ comes complete with Weber's Stainless Steel Gourmet BBQ System grate as standard. Opening up a world of cooking opportunities, the GBS cooking grate includes a removable centre section which can be easily interchanged with any one of the Weber Gourmet BBQ System Accessories - each available separately. The Weber Spirit Premium S-320 also has a mesh gas bottle screen to hide those ugly gas bottle on your patio as well as a handy condiment holder on the left hand side of the barbecue. Ok so lets get down to the nitty gritty and put these awesome barbecues side by side and see what they've got to offer you. Fantastic value BBQs 2U Weber Spirit BBQ Mega Bundles - All the kit you need to get fired up! Weber high quality BBQ products bundled together at amazing prices. BBQs 2U Mega Value Weber Gas BBQ Bundles have been hand selected by our Weber Experts to contain all the kit you need to get fired up! Save money and buy all the essentials in one go. What gas do I use with a Weber Spirit BBQ? You need to use Calor Patio Gas (propane) or similar. The 5kg bottles fit nicely inside the cabinets of the Weber Spirit barbecue hidden from view. The larger 13kgs gas bottle have to be stood to the side or behind the Spirit barbecue. The regulator on Weber gas barbecues is a 27mm clip on version, which is very easy to use. What is the difference between the Spirit Classic and Spirit Original models? - The Weber Spirit Original models (Original E-210, Original E-310 and Original E-320) have a solid cart door whereas the Spirit Classics have a mesh screen, that slides up and off. 5kg patio gas bottles can be placed inside the cart on both models, bigger 13kg bottles have to go outside to rear or side. The ignition system is electronic on the Spirit Original models which is powered by an AA battery rather than a mechanical push button that generates a spark on the classic versions. The cooking grates on the Weber Spirit Original models are Porcelain-Enamelled Cast Iron compared to Porcelain-Enamelled Steel on the Weber Spirit Classic BBQ models. 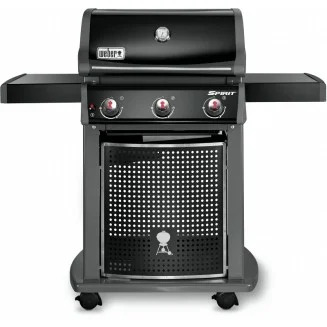 Both Weber Spirit Original BBQs and Weber Spirit Classic BBQs have stainless steel burners. New for 2017.. is the Spirit bbq range not quite big enough then take a look the Weber Genesis II BBQs, they have been completly redesigned for 2017. Each Genesis® II and Genesis® II LX barbecue is equipped with the same basic components and features; such as the GS4 high performance grilling system, iGrill 3 ready, and Infinity Ignition. Large cooking areas. The Genesis® II LX takes it up a notch, offering everything you need – and then some. This series includes additional upgraded features such as a side burner, High+ heat setting, and illuminated control knobs.